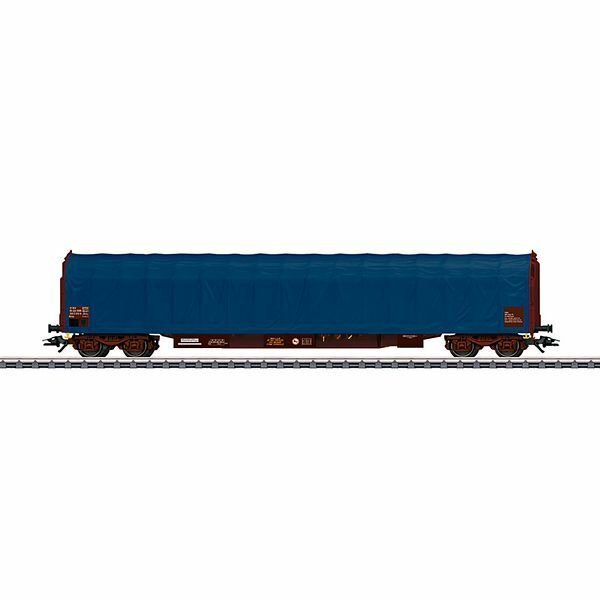 Prototype: Type Rilns four-axle sliding tarp car with a blue tarp. SBB/CFF/FFS Cargo sliding tarp car. European standard design with a length of 19.90 meters / 65 feet 3-7/16 inches. Version with rectangular buffers. Model: The car has type Y 25 trucks in reddish brown. It also has a metal insert for good running characteristics. The underbody is specific to this type of car. The car has many separately applied details and a representation of a closed tarp. Length over the buffers 22.9 cm / 9". DC wheel set E700580.